1) Why visit the Mondulkiri Project? We have a 100% safety record. Our elephants are very friendly and love all of our guests. We are 800 metres above sea level so the temperatures are a lot cooler than the rest of Cambodia and the air is fresh and clean. 2) How do I get to the Mondulkiri Project? Sen Monorom, Mondulkiri is only a 5-6 hour minivan ride from Phnom Penh in Cambodia’s east. It is 10 hours from Siem Reap, and 3-4 hours from Kratie and Ratanakiri. If you don’t have much time or are in a hurry you can hire a private taxi from Sen Monorom to get back to Phnom Penh on the same day your tour ends at a cost of $100. It is also possible to do the two day tour in 1.5 days (trek first day, 1/2 day elephants second day) so that you can catch the minivan back to Phnom Penh at 1pm. Click this link for transport options to Mondulkiri from Phnom Penh, Siem Reap, Kompong Cham, Kratie & Ratanakiri. 3) Do I need to book and how do I pay for my tour? Yes you need to book because our tour size is limited to 20 people. You can book via our website using this link, preferably 1-2 weeks in advance. Sometimes our tours are fully booked so the earlier you book the better your chance of getting the tour date you want. Payment can be made in US Dollars on the day of the tour or when you check in at the Tree Lodge Bungalows. You cannot pay by credit card. Sen Monorom has two atm machines on the main road that accept Visa and Mastercard. 4) Do I have to carry all my things on the tour? No you don’t. We have a storeroom to keep any of your luggage that you don’t want to take on the tour with you. You will need a small daypack for your clothes and a water bottle. 5) What should I bring? Sturdy, enclosed footwear for hiking in the jungle. Sports sandals and trainers are okay for our one day tour. 6) What is the food like? We have vegetarian options at each meal. If you are vegan or have allergies please let us know by email. You may want to bring additional snack foods for in between meals. Unlimited water is also provided free of charge. 7) Where does my money go? Your trekking money goes towards renting the forest you will visit for the next thirty years. This prevents logging and habitat destruction in this area. No other treks you will book in Sen Monorom rent a forest from the Bunong hill tribe people. So you will be helping to conserve a forest which is now providing economically and ecologically sustainable income for the local elephant owners and Bunong people. We pay monthly wages, pay medical bills and provide food for our Bunong guides and mahouts and their families. Most of our money goes to buying elephants so they can live a long and happy life. We also rent elephants from some owners to keep these elephants in our sanctuary. The elephants you will see at the Mondulkiri Project are now protected and no longer used for elephant rides or heavy farm work. We also donate money to support the protection of the wild elephant population in the nearby Keo Seima Wildlife Sanctuary. 8) Why is elephant riding not allowed at the Mondulkiri Project? 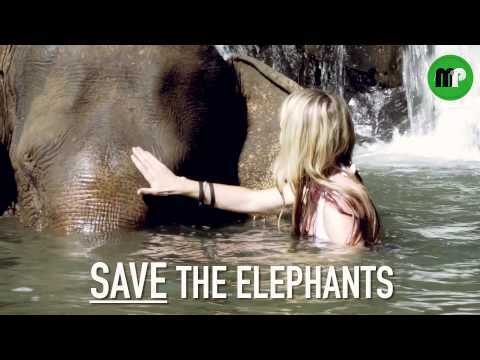 There are an estimated 75 captive elephants in Cambodia of which an estimated 47 live in Mondulkiri Province. In the past these elephants have been used for hard physical work such as carrying heavy timber or farm supplies. They have also been used for elephant rides. Elephant used for rides do not get enough time to eat and drink water or spend time in the shade to keep their bodies cool. Elephants used for tourist rides at Angkor Wat often die from exhaustion. Elephant rides can also cause long-term damage to the spine of an elephant as they are not strong enough to be carrying a bench seat with several people sitting on theme. The Mondulkiri Project is committed to responsible tourism and our goal is to protect and provide genuine care for our elephants. Our elephants health is regularly checked by Cambodia’s top government vet who is based in Phnom Penh. All the elephants at our sanctuary have been retired from any form of work so they will enjoy a long and happy future of eating, drinking, scratching, swimming and playing in the mud. I understand that activities with elephants and trekking through the jungle, by their very nature, involve risks and dangers. I assume all responsibility and do NOT hold Mondulkiri Project, its owners, staff or management responsible whatsoever for any loss, injury or death to my person or property during the tour. I participate in all activities at my own risk. These terms and conditions apply for every person who is booked on our tours.